The 2011 study by Gfk bluemoon for the Australian Communications and Media Authority (ACMA) entitled, ‘Like, post, share: Young Australians’ experience of social media’ is a must read for all who are concerned with the education of Digital Citizenship in schools. Although it is now 4 years old, this study raised some concerns for me regarding how we handle the concept of Digital Citizenship with our students. 1. Many schools have identified the importance of educating students in Digital Citizenship and are beginning to integrate Digital Citizenship into their curriculum or personal development programs. This is a fantastic start, as creating awareness of Digital Citizenship is essential, however, what is often overlooked in these programs is the fact that there must be a tessellation between education and modelling. The more I teach and read about digital citizenship in the classroom, the more I am coming to terms with the fact that, in order to have an effective influence on your students, you need to be open to discussion and modelling around what you ‘preach’. The ACMA study discussed that often, students are quite well educated in cybersafety, the concern is more that they don’t put their knowledge into action when they witness or partake in risky behaviour. By modelling Digital Citizenship for your students through having an active PLN, discussing personalised issues as they arise, and actively engaging students in your online behaviours, they will not only ‘know’ what is appropriate but also ‘see’ what is appropriate, challenging them to follow your lead. 2. It’s all well and good for specialist teachers, such as Teacher-Librarians, to teach Digital Citizenship however, this isn’t effective unless the same lessons are followed up by classroom teachers and parents. The ACMA study found that many students model the online behaviours of their parents and older siblings. While many parents believe they are supervising the behaviours of their children online, often this is limited to managing the time they spend online, not the content they are accessing. Also, parents believe that it is adequate to monitor their child’s interactions online through ‘friending’ them on Facebook, completely unaware that children report all of the important online interactions happen through chat and private messaging. The ACMA study also indicated that students are more likely to take greater risks online if their older siblings are active online, without the maturity to realise the consequences of their behaviour. Similarly, if classroom teachers are not modelling positive Digital Citizenship in class, students are less likely to believe that they should be good digital citizens. This refers back to the difference between education and modelling. My concern is that we spend time in school teaching and modelling appropriate online behaviours, but parents and the wider community have limited awareness of Digital Citizenship and thus, aren’t modelling these behaviours to the students. This provides a disconnect between what students are learning in school and what is actually happening in the ‘real world’. Hence, the ACMA findings that students are often aware of what constitutes appropriate behaviour but ignore their learnings in favour of partaking in behaviours that ‘everyone else is’, make perfect sense. Understandably, students are less likely to heed advice from parents or teachers who aren’t ‘tech savvy’. 3. Following on from this, many students find that they ‘know it all’ when it comes to Digital Citizenship and online behaviours and the older they get, the less responsive they are to education programs. What they need are relevant, engaging examples and discussions that they can relate to personally. Consequently, enlisting the help of experts from the wider community who can demonstrate the effects of poor digital citizenship and risky online behaviours to students, both in the short and long term, is much more effective than ‘preaching’. 4. The biggest take away that students get from interacting online is feedback. They ‘post’, ‘like’ and ‘comment’ on the things that they want others to see and do the same on. For example, a student posting a ‘selfie’ on their page is clearly waiting for others to ‘like’ or give their feedback on the image, creating a need for the approval of their peers. This in itself creates a struggle for students as they build, negotiate and present their personality and identity through their online interactions. The actions and identity of students are no longer confined to the physical environment. 5. For me, the ACMA study reflected that educators are doing a great job in providing students with the information they need to be good Digital Citizens and behave responsibly online. What we need to focus on now is how we make students aware that their actions online are permanent, and not easily erased. The concept of a digital footprint is something that students find difficult to grasp, as the future seems such a long way away. What students put online will increasingly affect their job opportunities in the future, as employers find inappropriate comments, images and interactions with a simple Google search. Again, we need to prove students with real-life examples of positive and negative footprints and model digital footprints through our own actions online, particularly with the emergence of mobile social networking and geo-spatial tagging. I often ‘Google’ myself with students to demonstrate how we can manipulate the information about us online in a positive manner. This is just as essential as being aware of cyber safety and responsible behaviours. 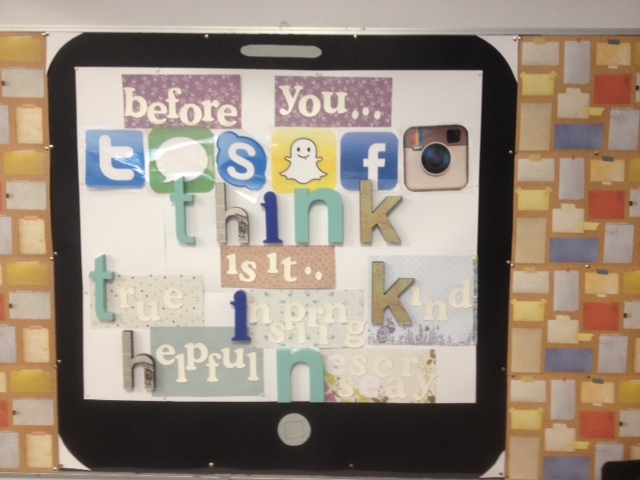 We need to see the bigger picture in regards to Digital Citizenship. Pushing information to students regarding digital citizenship is not enough. To be effective we must be modelling and providing the connect between education and reality. 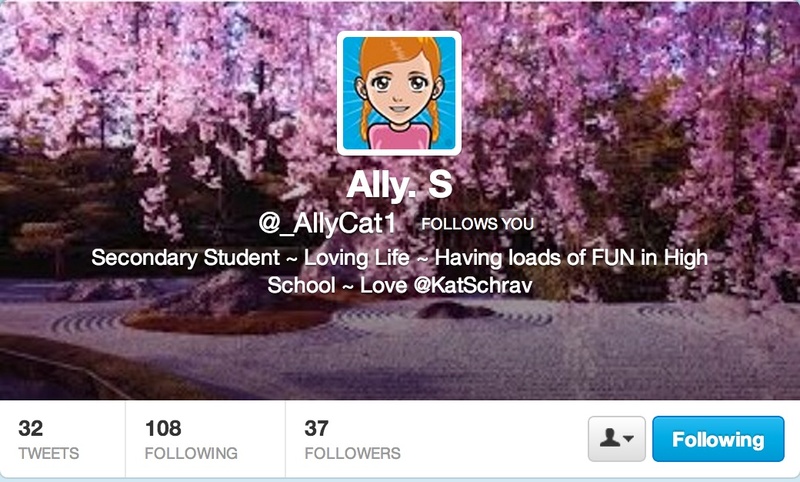 Welcome to Part 1 in a series of posts about my experiences with Twitter in the classroom.. Happy reading! There is much debate in the educational world at the moment regarding the use of Social Media as a teaching and learning tool in the classroom. For a year or so now I have been using Twitter as part of my Professional Learning Network (PLN) and am overwhelmed at the collaborative opportunities this has created for me. I have never been so up-to-date in my professional reading and am constantly altering my lessons to incorporate skills or resources that one of my peers has shared with me over Twitter. Not only is this providing me access to great resources, but I am reading stories about what has and hasn’t worked for others and am able to adjust what I do and learn from their professional practice. I have gained so much from my PLN on Twitter that I couldn’t stop wondering whether my students would benefit similarly. Of course, as with everything we do in the classroom, I stopped to consider whether or not Twitter would have a genuine purpose in the learning of my students and what I would gain (or lose) from using it as a teaching tool. This lead me to evaluate the reasons why I wanted to use Twitter with my class (other than the fact that I was completely in love with it) and really stop and plan exactly how I would implement and control the usage of the tool with my students. Currently I teach in the Middle Years and am with my year eight Integrated Studies (an Integration of English, Religion and Social Science based around the Inquiry process) class 10 times a week. As a Teacher-Librarian, I am also involved in the Research and Technology subject that all Year Eights in the college take, focusing on ethical and responsible use of technology and creating a positive digital footprint. As this is the students’ first step into secondary school, I believe that it is essential for me to build strong working relationships with these students, ensure they are comfortable in their learning and assist them in building relationships and collaborating with their peers. Essentially, there were three main areas I believed Twitter would benefit their learning experience: relationship building, broadening the horizon of the classroom and collaboration. My main concern regarding Twitter was, of course, regarding privacy and controlling the information the students used and posted on the site. Obviously there is great concern regarding security and privacy when students are on Twitter and this is something educators need to really consider before embarking on any social media journeys with their students. Firstly, it is impossible to control 100% of what your student’s post online so this is a mindset you need to get your head around before starting. Secondly, Twitter, in my belief, is a social tool that can be used for professional purposes. Thus, when I use Twitter with my students, they need to be aware that everything they post is potentially viewable by the whole world and should be completely professional. Students are using Twitter to start creating their digital footprint, and as such, I would expect that this is something they would want to keep professional for the sake of possible employment and career opportunities. It is important to discuss with students the difference between a personal and professional presence online. Facebook is an ideal place to network personally with friends and family as the security settings make it possible to control who does and doesn’t see you posts, photos and status updates. Twitter on the other hand, is limiting in the privacy of your account and who sees your page and tweets and thus, it not the best tool to use for personal networking. Once you consider these factors, privacy and security shouldn’t be such a concern when using Twitter in the classroom, as long as students are aware that they are using Twitter for a professional purpose only. This is something that needs to be explicitly discussed and modeled for students throughout the process. Once you explain to students that their tweets and followers can be seen by anyone, particularly their teachers, parents and the school leadership team, they are very careful in assuring that their use of this is only professional. This has been one of the biggest realisations for me in this process – ensuring students are clear on the purpose behind the learning and the tools they are using will ensure they respect and understand the boundaries that come with using these tools. Of course, if you allow a student to sign up for Twitter without explaining the purpose of its use, you can expect that they will use it however they see fit, and this is what you want to avoid happening. Also, be aware that as the teacher, you should have a sound understanding of Twitter and its usage and be confident with this before embarking on this journey with your students. Interestingly, after sending letters home to a class of thirty students, I only had two concerns raised. The first parent was concerned about their student using their full name and this is something that was easily addressed (see section on setting up accounts). The second parent was concerned that their student had learning difficulties and would be difficult to monitor on Twitter. This same parent was also wondering whether Tweeting with only 140 characters really had any educational benefits. Now, I completely understand that a parent of a student with learning difficulties would not want their student to use Twitter, however, I did believe it was important to ensure the parent understood the benefits of using Twitter, and realised that this was not something we were simply using in school because it was in fashion. After sending an email home further explaining the benefits and learning opportunities of Twitter, the parent changed their mind and the student was allowed to begin using Twitter with strict rules in place regarding who they could follow and their tweets. It is understandable that parents will be concerned about their students in an online and public environment, however, a lot of these concerns come from not having a clear understanding of how Twitter is used. This is easily overcome by presenting the parents with relevant, well-researched information and ensuring that your use of Twitter in class really does have purpose. After receiving the ‘all clear’ from the parents of students in my class, we were almost ready to sign-up and start Tweeting. Before this, I spent some time reiterating and discussing the concept of a positive digital footprint (something that is also taught in Year 8 Research and Technology classes) with my students. I also spent some time going through my Twitter profile and usage with the class so they had a clear understanding of it’s usage. I found the students picked up how to use Twitter in no time and hashtagging or using Twitter handles was something they were already doing between Instagram, Facebook and Snapchat. Once I felt confident that in the responses of students in class discussions, we were ready to begin the signing up process. At this stage, it is helpful to work in a team with your teacher-librarians or elearning manager as there are a number of things you want to check with each individual student during the process. 1. 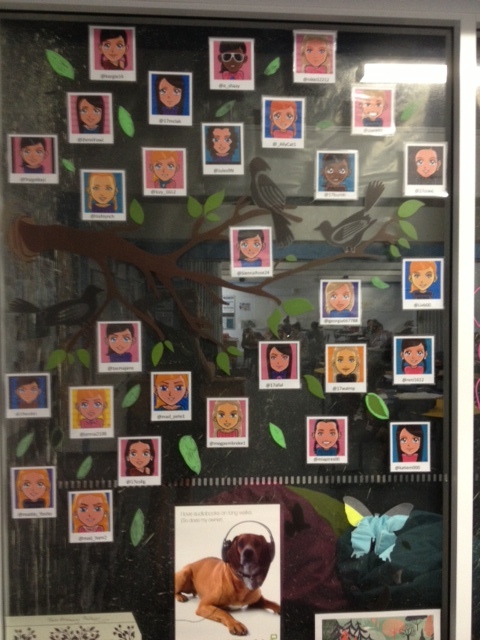 Creating an avatar – During our digital footprint discussion we made students aware of the importance of controlling what images of them were on the Internet. We have a standard rule in the college that they may not post pictures in their uniform to social networking. We also, discussed the importance of using the same image across their PLN so that people would begin to recognise them. This is why we decided to use Avatars for the students profile picture, as they could show their individuality without using and actual image of themselves. We used a free app called ‘Face your Manga’ and, after a discussion about what constitutes professional dress, we were very happy with the Avatars the students constructed for their profile. 2. 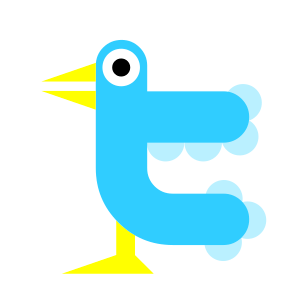 Twitter name and handle – Students were given the option of creating a twitter name and handle that allowed people who knew them personally to identify them, without giving away any personal information. Again, we showed them a range of handles being used by staff at the school and discussed appropriateness in professionalism and length of Twitter handles and names. 3. Bio – Similarly, it’s essential that your Twitter bio lets fellow users discover something about you without pinpointing your exact location or school. We encouraged students to write what they were interested in learning, something about their activities outside of school and something about their personality. All three of these areas needed to be approved by a staff member before students could add them to Twitter. This process was successful in ensuring that students were presenting a professional profile on Twitter and we were confident that users would not gain important personal information about the students when viewing their profile. Once students have signed up, it is important to discuss who would be appropriate for them to follow. I feel that they should be able to follow particular celebrities they like, however, did discuss that potential employers would be able to see who they followed, so it was important to follow only those that they believed were positive role-models. We also discussed that who you follows shows much about your personality and this is something students needed to be aware of. 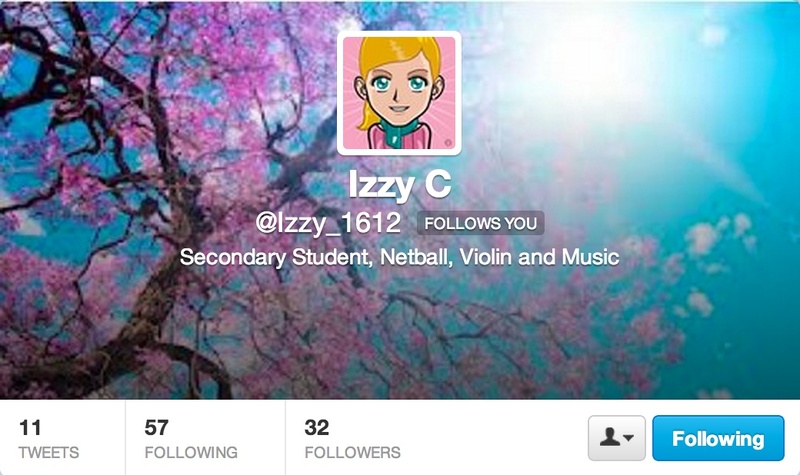 I also mandated that students must follow myself, the college teacher-librarians and the college iCentre page. I made sure I was following all of the students in my class so I would receive their Tweets in my news feed. As you can see, a lot of background work needs to go into preparing students for Twitter use and I believe this is essential if you want to reap the benefits of having your students learn and collaborate with Twitter. At the end of this process, I felt confident in the profiles of my students and their awareness of appropriate use and was excited about ‘tweeting’ with them – looking forward to sharing how this has been happening in class in my next post!